Perhaps you caught Anthony Bourdain – Parts Unknown, wherein famed-among-foodies chef Anthony Bourdain takes a bro-cation in rural Newfoundland with renowned Newfoundland chef Jeremy Charles et al. in search of that elusive moose. Using the abundant wild foods of Newfoundland is a passion among many who lead the local food movement here, from Raymond’s restaurant to the Fogo Island Inn. Outside of the restaurant industry, another one of those people is Lori McCarthy of Cod Sounds, who does Forage & Feast outings – a walkabout through the woods followed by a seafood meal, prepared over an open fire and served on the beach. She offers educational workshops on hunting, preparing, preserving and curing local foods. Gathering around a meal remains so much a part of life here, whether it be outdoors – a boil-up (NEVER a picnic), over an open, upside-down fire (whereby the biggest junks of wood go at the bottom and the smallest splits at the top, in order to boil the kettle more quickly), or sharing a traditional meal like Jigg’s Dinner – Newfoundland root vegetables and cabbage boiled in one pot with salt meat and peas pudding, around the table. In the past, Newfoundlanders had a meal plan that saw them eating certain meals on certain days of the week, which is why you’ll still find Jigg’s dinner on the menu of local restaurants on a Sunday or Thursday, but never on a Friday. Codfish centered in many dishes, from Fisherman’s brewis – a meal of saltfish and hard tack (cakes of dried bread), drizzled with scrunchions (rendered bits of salt pork), to salt fish and drawn butter (a delicious sauce made of onions and butter) to modern casseroles of fresh fish, abundant in local cookbooks – some with dressing (known as stuffing on the mainland), like that served at the Rising Tide Dinner Theatre ,or one we serve to off-season visitors, who are invited to dine with us when local restaurants are closed, which features onions, egg, tomato and cheese. Speaking of local cookbooks – one of our favourites is The Treasury of Newfoundland Dishes, re-published on its 50th anniversary, by Boulder Publications. Our famed blueberry pancake recipe can be found herein. The names of the women who sent in the recipes are indexed, by community, in the back, including my husband’s grandmother. I say women because Newfoundland traditionally had a division of labour that had men at sea fishing while women managed all things on the land from raising children to tending the salt fish as it dried on the flakes, from growing the vegetables to picking the berries that would carry them through the long winter when supplies no longer came by seasonal schooner. Traditional Christmas fruitcake and steamed puddings made with local berries are as much a part of the food heritage of Newfoundland as “bottled moose” and fishcakes. Recipes for it all can be found here, along with a few relics of the housewife culture at the date of publication, like Shipwreck Dinner – a casserole that layers local vegetables and tops off with sausage or ground beef, a can each of peas and tomato soup. We hope you’ll enjoy some of the links below, which capture bits of the culture, the essence of the cyclical life here, the seasonal food, and the abundance the Newfoundland landscape provides. 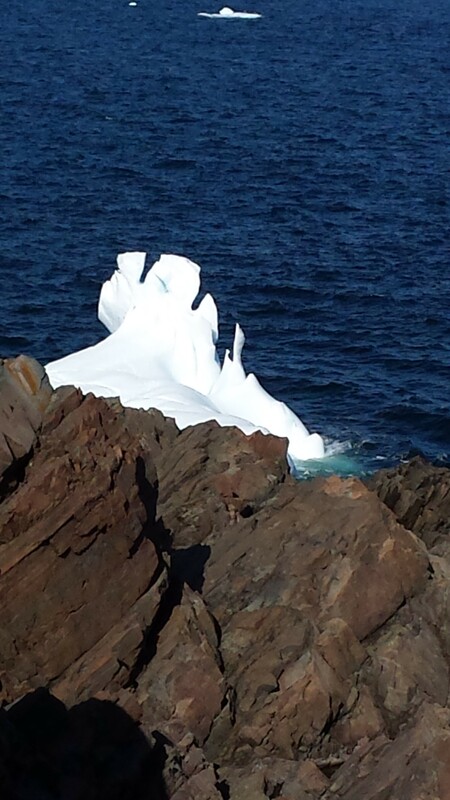 It is a stunning spring for viewing icebergs here on the Bonavista Peninsula. There are more icebergs floating off our shores than we can count. 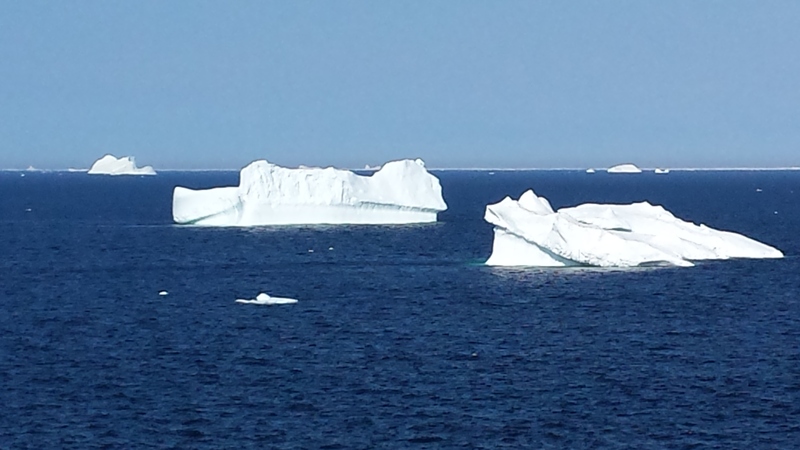 There are a couple of small icebergs in view from Trinity. A drive up the coast with stops in our neighbouring communities will leave you in awe of nature’s beauty. 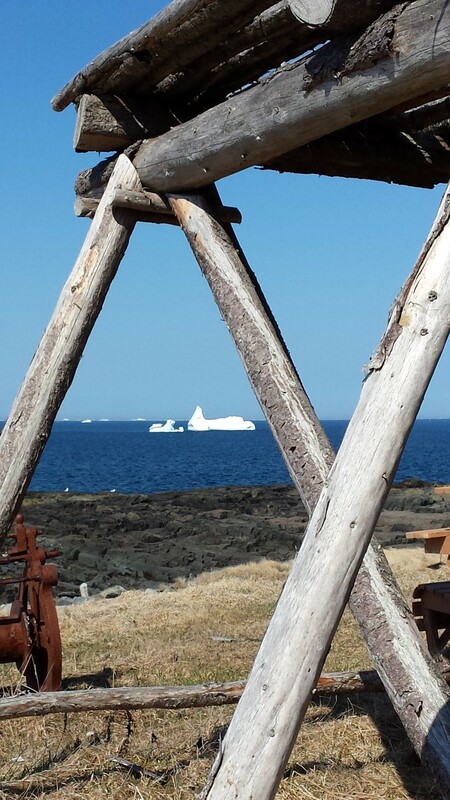 This past long weekend we took a ride up the coast ourselves losing count of the many icebergs we saw, snapping photos constantly, picking up pieces of icebergs off the rocks, and upon our arrival home enjoying some berg cubes in our glass of wine or soda.